Accommodation: Gunn's Main Camp accommodation is in 7 luxury meru tents with en-suite bathrooms, there is a combination of twin and double bedded tents, so please request your preference. 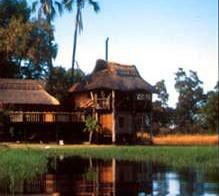 In addition there is an elevated honeymoon suite under thatch with a private balcony. Contact host Sales Office for details on honeymoon packages. All tents have lighting provided by generated electricity. Towels and a laundry service are included in your stay. Inclusions: En-suite Tented accommodation, meals, selected local beverages, activities and National Park fees. Amenities: Elevated lounge and dining area, small library with reference books, swimming pool, boma area and laundry service. Video batteries can be recharged, an adaptor is provided at camp. Child Policy: Children over the age of 10 years are accepted on application and are under the full responsibility of their parents/guardians. A Typical Day: A light or full cooked breakfast is served to fit in with your activities. A morning activity is taken - as planned with your guide/Camp Managers and return to camp for lunch and a siesta. Afternoon tea is served, after which you can enjoy an afternoon activity until sunset, where you return to camp as per the regulations of Moremi Game Reserve. 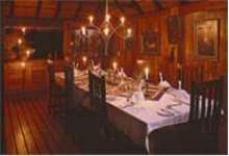 A three course dinner in the dinning room or a BBQ dinner at the campfire is served and the evening can be enjoyed relaxing in the lounge or around the campfire. It is also an option to take a full day trip with picnic lunch if planned with the Camp Managers. 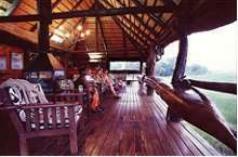 En-suite Tented accommodation, meals, selected local beverages, activities and National Park fees.